April 2019, Environmental Law Review Symposium Protecting Tribal Land, Water, and Resources. Fordham Law Symposium. March 26, 2019, Leaders of Color Lunch Series SU Law, hosted by Inclusion Initiative Committee, Student Affairs & Native American Law Student Association. 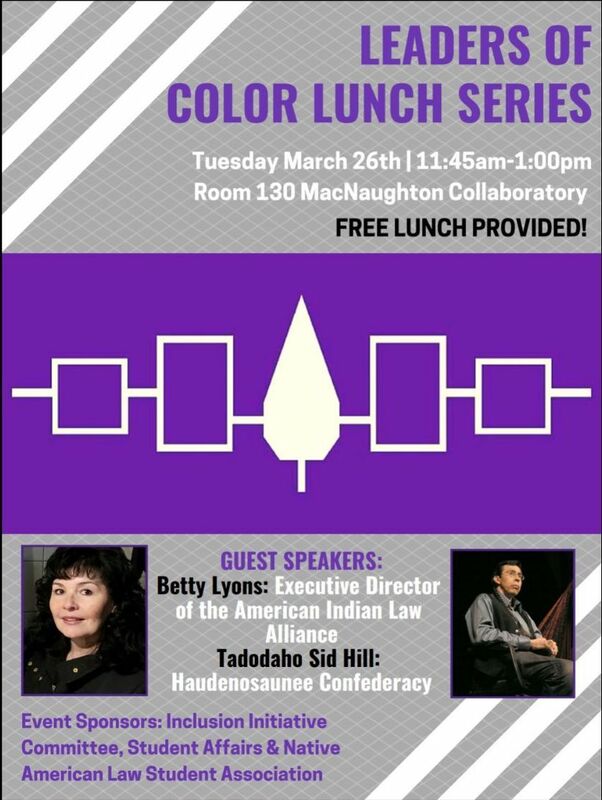 Guest Speakers: Betty Lyons, Executive Director of the American Indian Law Alliance and Tadodaho Sidney Hill, Haudenosaunee Confederacy. March 2019, The Women’s Suffrage Movement by Academic Initiatives and Strategic Innovation. January 2019, Members of Diversity Council, Chancellor’s Workgroup and Sustainability Management Tour Great Law of Peace Center. October 2018, Cazenovia College talk. October 2017, Wooden Stick Festival. October 2017: Wooden stick festival.